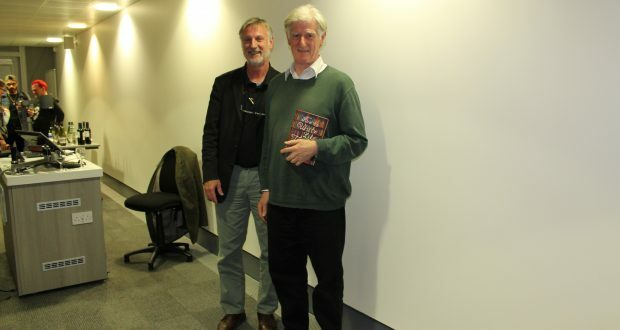 Director of Kingston Writing School Dr David Rogers and non-fiction author Richard Cohen. Bestselling novelist, editor and visiting professor at Kingston University Richard Cohen spoke yesterday about Kingston being his first inspiration for his new book How to write like Tolstoy at the Kingston Writing School lecture series. How to write like Tolstoy is a guide on how to write. Cohen, 69, used many of his own experiences writing and editing award-winning works for his new book. In fact a lot of his anecdotes stem from his time as visiting professor at Kingston University from 2004 to 2011. “Students at Kingston have so many different backgrounds. Most of them were so interesting and so lively, and you also get, while you get a lot young students, you also get in the Creative Writing department people in their middle age, who are taking courses in order to write or to work with writers. And the classes I had, you have had a real mix of ages and abilities and backgrounds and I love that,” said Cohen. Cohen’s new how-to book was published in May of this year and it has received good critics and a lot of praise from magazines like the Wall Street Journal and Publishers Weekly. Cohen’s personal love for literature, reading and writing translates into his work. Yesterday he presented his book before the Kingston School of Writing lecture series. With a lot of wit, jokes and personal anecdotes he talked about how he wrote How to write like Tolstoy and read from the first chapter. “People asked me how do you write like Tolstoy? And I say: 900 pages in Russian,” he jokes about responses to his work. Cohen, born in Birmingham, said that teaching at Kingston University and being with students influenced him positively as a writer. “It enables you to try things out and you get feedback, which can be rude or helpful, but I had a number of students who were really interesting and responsive so they were party to in a way, to what I produced and that kind of relationship I very much enjoy and miss now,” Cohen said. Yemi Dipeolu, 25, Kingston MA student in Creative Writing was pleasantly surprised after attending the talk. “I thought it would be very formal, but it was really good and helpful. He’s a very engaging speaker,” she said. The lecture series of the Kingston Writing School this term has a line-up of writers of fiction, non-fiction, poetry and short stories come in for a free workshop every Wednesday.